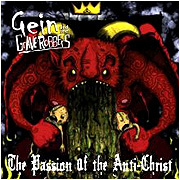 Artist: "Gein and the Graverobbers"
Album: "Passion Of The Anti-Christ"
Review: Don't be fooled by the cheeseball cover and godawful title; Gein and the Graverobbers' "Passion of the Anti-Christ" is a fantastic album. Consider this album as required listening if you love surf music. Though G&G doesn't reach the instrumentality of bands like the Mermen or Torquays, the riffs are solid and stay in your head for days on end, particularly on tracks like 'The Creeping Terror', 'Of Gods and Monsters', 'Severed', and 'House of Skulls'. Anti-Christ also provides leaner, meaner, and more polished songs than its preceding album, the 2003 'Songs in the Key of Evil', making you wonder what the band could accomplish with another studio album and more love from fans (At least this one's available on iTunes). There are very few weak offerings, with G&G managing to both retain their sense of humor and avoid the grating quality that some surf music falls into after repeated listening. Unfortunately, there's no real stand-out track, and little stylistic difference between songs (compare with Danzig's first album). The occasional goofy audio-bite also seems unnecessary; the surf aspect speaks for itself. Still, it's a great buy, and proves a perfect way to ease into the Halloween season. *note to any Italian directors, or possibly Guillermo Del Toro: Make this movie. Now. With the artwork cover and title I wasn't expecting it to be surf rock. I was expecting it to be some sort of death metal garbage.